We’re just 17 days away from the voter registration deadline in California where Latinos are 39% of the population but are historically one of the groups with lowest voter turn out. Together we can change that! 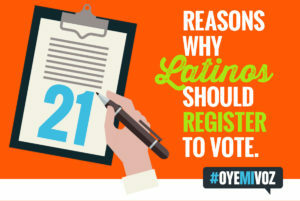 In 2016 about 6.9 million Latinos will be eligible to vote in California. With so much at stake for the Latino community—from immigration, the economy, healthcare and the environment – we need to make sure our voice is heard at the polls. Register to vote by the May 23 deadline – ensure that you have the opportunity to vote this June for the state and local candidates and ballot measures that will impact your community, your family, and the issues you care about. 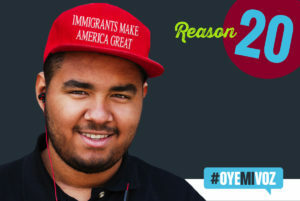 Need more reasons to register to vote? Follow us on Facebook and Twitter to track our countdown to the CA voter registration deadline on May 23. We’re posting a reason every day explaining why we think it’s crucial to register to vote – but we want to hear your reasons, too. 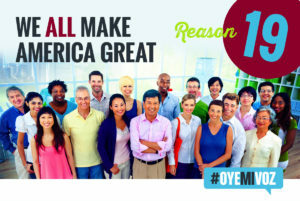 Join the conversation and tell us what’s your reason to register to vote! With the primary elections almost coming to an end, there is a lot happening in politics. Stay informed. Here are some of the top headlines from this past week. The Mexican rock band Maná, performed at the Cinco de Mayo celebration in the White House. They took that opportunity to urge Latinos to vote and get involved. Elections 2016: What’s at stake for California?